Northwest Georgia is a beautiful region full of beautiful landscapes. The tourist region is The Historic High Country, with tremendous amounts of fascinating historical areas from The Civil War, railways, and home of the Carpet Capital of the World. 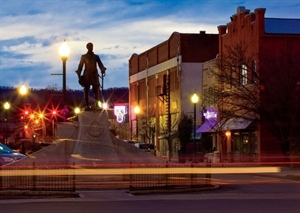 Located 30 miles from Chattanooga, Tennessee and around 100 miles from Atlanta, Georgia- there is plenty to venture out to do outside of Dalton, while still having the luxury of living in a quiet and comfortable, rural town. Includes Cities/Towns: Dalton, Rocky Face, Tunnel Hill, Varnell. Public transportation directly in Dalton is minimal, outside of taxi's and vans. Though, both Chattanooga and Atlanta are nearby major transportation hubs. Jan 29.9 F° 39.5 F° 49.0 F° 5.9 "
Feb 32.4 F° 43.3 F° 54.2 F° 4.9 "
Mar 39.8 F° 51.4 F° 63.0 F° 6.3 "
Apr 46.9 F° 59.4 F° 71.9 F° 4.3 "
May 56.0 F° 67.7 F° 79.3 F° 4.3 "
Jun 64.6 F° 75.3 F° 86.1 F° 4.4 "
Jul 69.1 F° 79.3 F° 89.4 F° 4.8 "
Aug 68.0 F° 78.3 F° 88.5 F° 3.7 "
Sep 61.8 F° 72.3 F° 82.8 F° 5.0 "
Oct 48.6 F° 60.8 F° 73.0 F° 3.3 "
Nov 40.4 F° 51.4 F° 62.4 F° 4.8 "
Dec 33.0 F° 42.8 F° 52.6 F° 4.9 "
Spring temperatures are cool with averages in the upper 50's and highs in the low 70's. Nights are cold with lows in the upper 40's. Summer temperatures are warm with averages in the upper 70's and highs in the upper 80's. Nights are mild with lows in the upper 60's. Fall temperatures are cool with averages in the low 60's and highs in the low 70's. Nights are cool with lows in the low 50's. Winter temperatures are cold with averages in the low 40's and highs in the low 50's. Nights are cold with lows in the low 30's.